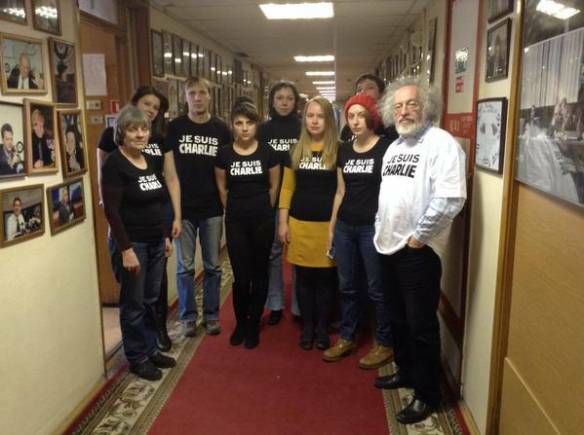 Moscow Echo shows solidarity with Charlie Hebdo. Despite the apparent deadlock in armed clashes in eastern Ukraine, an idea to bringing together the presidents of Russia and Ukraine, together with their peers from Belarus and Kazakhstan as well as the leaders of France and Germany, gained momentum at the end of last week. Kazakhstani President Nursultan Nazarbayev made an unscheduled visit to Berlin on Friday (January 9), seeking to persuade German Chancellor Angela Merkel that a summit in Astana on January 15 could make sense to break the Russian deadlock in the talks, and he then had a telephone conversation with President Vladimir Putin (Rossiiskaya Gazeta, Kremlin.ru, January 9, 2015). A day before that, Merkel held talks with Ukraine’s Prime Minister Arseniy Yatsenyuk and made a firm statement that the third package of sanctions on Russia could be lifted only after Moscow ensures the full implementation of all ceasefire provisions as agreed in Minsk in September 2014 (Newsru.com, January 8, 2015). The same position was taken by Federica Mogherini, the European Union’s High Representative for Foreign Affairs and Security Policy, who also mentioned some “positive signals” on changes in Russia’s position; but neither Merkel nor Mogherini expressed any interest in a summit (RIA Novosti, January 8, 2015). The rest of the article is in Eurasia Daily Monitor, January 12.